Have you heard of Kong dog toys? 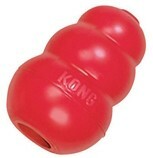 From bedding and grooming supplies to toys -- Kong has some great products. Here's why we love Kong Dog Toys. 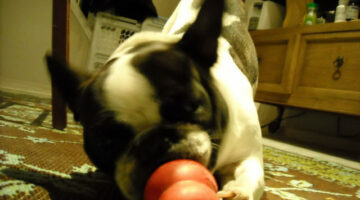 Interactive dog toys (or enrichment dog toys) provide a challenge for your dog. Their unique features keep your dog interested & having fun for hours! These are the best ones to start with — use them to gauge your dog’s interest and chewing behaviors before you buy a bunch of toys for your bored dog. Tough dog toys!… A list of the best solid rubber dog toys, the most durable squeaky dog toys, the best plush dog toys for aggressive chewers, the most indestructible flying discs, and the best hard plastic dog toys for serious chewers. Tips for stuffing frozen Kong toys that your dog will enjoy on a hot summer day. Plus, lots of homemade frozen dog treat recipes! Save the proofs of purchase from your dog Kong toys! Once you get 10 of them, you can send them in and get this Kong Stuff It T-shirt for FREE. It’s the very first apparel item from Kong Company. My dogs have always love Kong toys, so I cannot wait to get one of these! 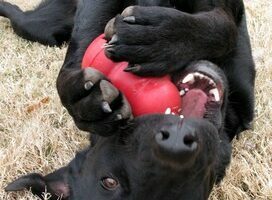 A collection of our best tips for dog Kong stuffing made easy! Plus little-known secrets about putting peanut butter and other sticky substances inside dog Kong toys. Here are all of the reasons that you should mix things up a bit when you’re stuffing dog Kong treats into your dog’s Kong toy. 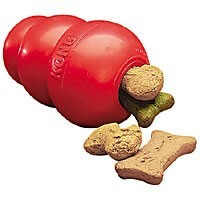 Plus, ideas for some new dog Kong treats to fill your dog’s Kong with. Tired of filling your dog’s Kong toy with the same old treat? Try making your own Kong treats! Here are some great Kong recipes using healthy human foods. Plus, tips for cleaning the inside of your Kong toy. Rachael Ray Dog Recipes: Yep, Rachael Ray Loves Dogs… And She Cooks For Them Too! Rachel Ray has a fairly decent collection of pet recipes that look fun & easy to make, including: Dog Casserole, Oatmeal, Bananas & Peanut Butter Breakfast, Peanut, Orange & Carrot Salad, Doggie Pasta & Meatballs, Mini Burgers Doggie Sliders, Chicken & Rice, Ham & Cheese Sandwiches, Meat & Potato Hash, Bacon, Cheese & Barley Burgers, Chicken BLT, Olive Oil & Bacon Truffles, Sweet Potatoes, Carrots & Chicken, Peanut Butter & Carob Biscotti, Banana & Berry Pooch Smoothie, Butternut Squash Mac & Cheddar, Pumpkin Barley With Turkey, and Pooch Pate On Toast. The Lowest Prices For Dog Kong Toys Online! Here’s a collection of my best articles about Kong toys for dogs. Practically every angle having to do with Kong dog treats & toys is covered here. See why we currently own 16 of them! See why I subscribe to the Kong Company e-newsletter, and why I highly recommend you sign up too. It’s FREE. And it’s loaded with fun ideas and games and photo contests for you and your dog to enjoy! Is your dog new to Kong toys? Or, maybe he’s simply bored with Kongs these days… Here are some ways to switch things up a bit. 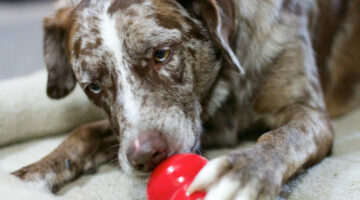 Fun new ways to make it more fun AND challenging for your dog to get treats out of a Kong toy. Bil-Jac frozen dog food is a great meal — AND a great treat! for your dog. 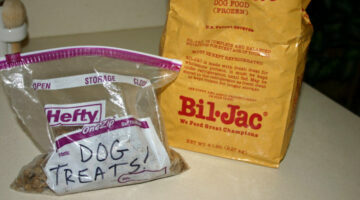 We typically use the the Bil-Jac frozen dog food as a ‘special treat’ for our dogs. Biljac works especially well as a treat during training. A dog’s hearing is 10 times more sensitive than a human’s, so the fireworks are likely to cause your dog some anxiety, stress and fear. Here’s what you can do in the hours leading up to the fireworks. 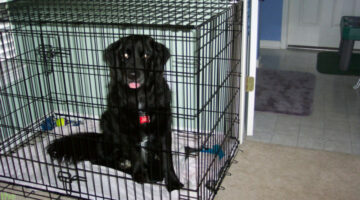 Plus, what to do if you notice your dog is overly stressed by the loud noises and bright lights. Kong toys are the best dog toys… ever! They serve double-duty, as a chew toy, and as a treat-dispenser. Here’s a listing of the best things about Kong dog toys, and why every dog owner should have one — or 4! Kong chew toys for your dog. A few things you need to consider before bringing another dog home… because two — and especially three — dogs under one roof comes with its own set of challenges. Been there, done that! Dog Recipes That Work Great In KONG Toys! Wondering what to stuff inside of your dog’s Kong toy? Here’s a list of the best Kong recipes that have worked well for other dog owners. These dog recipes make delicious treats that you can stuff inside a Kong toy. What do most people stuff inside their dog’s KONG toy?… While peanut butter is probably the most popular, it’s not the ONLY thing. Here are some ideas to get you started.